A GCM component offers support and education to your PDHC paraprofessional workers, giving them more skills, including professional one-on-one problem solving expertise. Adding a GCM can insure that paraprofessional home care staff do not feel like they are alone and can better work as a supported team member. They can train, orient, supervise and support in-home caregivers on each monitoring visit to the client. The GCM can offer on site training to the caregiver when reviewing client charting and talking paraprofessionals, one to one on site about their clients week. They can find problems before they become crisis. For example if the client has been staying in bed for a few days and it was never reported, they can pick that up before it turns into a crisis or hospitalization, because they monitor each week. In addition they reinforce reasons to call them for problems , on each visit and build up the trust in the paraprofessional to follow through. A GCM visit make caregivers feel they are a part of a team- someone that they can talk to get direction from. On site caregivers feel they are supported when a GCM visits weekly and calls regularly and is there to take their call and concerns about a client’s health or problems. A GCM does better spot-checking if caregiver is not doing a good job or not even showing up,solve caregiver arguments before crisis, keep clients and families happy through great supervised home care so you are not losing cases. Ø Accompanies clients to all medical appointments. Do GCM’s Help Families To Choose your PDHC agency at Critical Intake to Start The Case? Intake is the most critical point in opening or losing a case. A successful intake means increasing your private duty home care business. By you addition of Geriatric Care Management the GCM can be counted on to thoroughly assess the elderly person’s and family caregiver’s situation at the intake, determine level of care and level of GCM monitoring and sell your services. A GCM sells these services through their highly personalized and compassionate approach to families and clients. This breaks down to gaining client and family trust that your GCM and home care service is the very best path leading them the care they desperately need- led by a professional guide they can count on. They know they will get unbeatable customer appreciation, you will exceed their customer expectations, insure quality of life for the older client and offer a service driven private duty home care services. Geriatric care managers can show new clients how your concierge home care service will solve their problems through the GCM being there for them every step of the way. These hands on professionals can make families relieved and happy because they understand they save precious time and overwhelming stress by using professional GCM’s. Through the GCM at intake, families see that they can make sound decisions based on reality and assessment. They now know they will have all community service and resource options they could not find alone and are now available to them through your services. The GCM sells your home care at intake by this highly personalized, compassionate and professional approach. The addition of geriatric care management transforms a private duty home care agency into a concierge service. Why- a geriatric care manager is a powerful health care concierge, just like the new concierge medical services. This is a powerful new selling point to potential home care clients who are in the top income brackets. These are also the clients who can afford long term care geriatric care management and private duty home care. Why is combining the two services creating a concierge services? A geriatric care manager is a highly skilled professional who acts like a personal assistant to the aging family. They offer highly personalized aging parent care. GCM clients can reach them at almost any time and the GCM builds a deep relationship with the client and family. 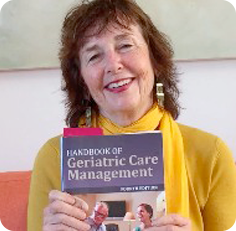 As a GPS through eldercare, the GCM helps them step by step through one of the hardest journeys in their life. A geriatric care manager’s highly personalized service meets all the needs of the aging family and the client. GCM’s are like a concierge at a 5 star hotel there to serve the family by solving their care giving problems and making elder care more seamless. Does Adding Geriatric Care Management to PDHC Give You Competitive Edge? Why should you add geriatric care management to your private duty home care agency? It can make a client shopping for a PDHA agency chooses you instead of your competition.. It shows what makes you are different from your competition. They learn that geriatric acre management plus private duty home care is an added bonus to families in a crisis. Thus a care management service can be an important differentiator for agencies that offer simply PDHC. It helps you get more clients and outstrip your competition. A geriatric care manager can do a great job of teaching clients and families why they need care. A geriatric Psychosocial and functional assessment and care plan are a very clear way for families to understand care needs and recommendations and to plainly see all the options for providing this care and choose your agency.The GCM is looked at like a desperately need guide not a salesperson to get services started. Care manager assessments are broader in scope that a private duty home care assessment and include not only family and social supports, and home safety, but spirituality, Quality of Life, finances, legal, nutrition, environment, mental status, depression, sibling rivalry, dysfunctional families, relocation options and assistance and death and dying. A GCM assesses for alcoholism and drug abuse, domestic violence, sleep quality, sexuality, activity tolerance, personal values, and cultural beliefs. So they offer an in-depth overview of clients’ and family’s problems. You geriatric care manager’s care plan gives recommendations and options to consider so the family and client can make the best choices for providing this care. The bonus to you is this lengthy very valuable assessment is billed .